Neil Hamburger is one of a kind. He’s a must see for any comedy nerds for his imitable demeanor and delivery. Shuffling onto stage with his greased and balding hair slicked into a tragic comb over, and cradling three glasses of water tucked between his arm and chest, “America’s funnyman” graces Cowgate with his presence. After a hilarious and unexpected musical introduction, what follows is an hour of hilarious and unique one-liners and gags. These can be “knock-knock”, “what do you call?” all the classics, but you’ll never get close to getting the punch line. No matter how obvious the set up seems, Hamburger consistently knocks it out of the park with surreal answers that take the audience completely by surprise and leave them in fits of laughter. His delivery is a work of genius, constantly spluttering and coughing into his drink he bursts into an ear piercing “KNOCK KNOCK”. Reminiscent of a lounge performer or old radio DJ in describing fellow performers as “leeeeegendary” or stressing that is MR. Osama Bin Laden. 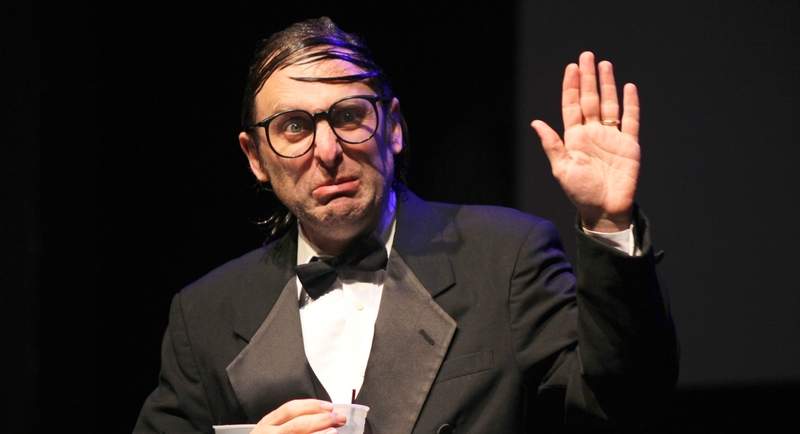 To use an old phrase, Neil Hamburger could absolutely read the phonebook and I’d go see it. His humour can sway between intentionally hack and groan worthy to shocking and controversial. It’s brilliant to watch him change pace between them and the audience on the edge of their seats for every joke, completely clueless as to what’s coming next. It’s this unpredictability that allows him to go on a long run of jokes one after the other at a fairly slow pace without losing the room. A fair few of the jokes went over much of the audience’s heads with very specific references, Hamburger lambasting the audience for clearly not doing their required reading before attending tonight. I seemed to be sandwiched in between the only two couples in the audience not having a great time, perhaps the best demonstration to me for what they didn’t enjoy about the show. Despite how much I enjoyed the show, I couldn’t help feeling a little let down by the ending myself. It really dragged and wasn’t working with the audience. Had it been a bit shorter an ending it would have been great, it was just the first part of the show that felt a bit too much. Still, you’d be absolutely remiss as a comedy fan to miss Neil Hamburger while he’s here, a complete one off and a comedy trailblazer.